Stay on the cutting edge of implant dentistry for the edentulous patient! 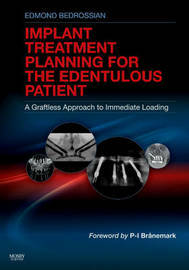 Written by Dr. Edmond Bedrossian, one of only a few specialists doing zygoma implants, Treatment Planning for the Fully Endentulous Patient: A Graftless Approach to Immediate Loading covers the latest advances in implants, products, and techniques. The book discusses the broader issues of working with the edentulous patient, then describes 1-stage and 2-stage protocols, immediate loading, and the graftless approach. Also included are insightful discussions of case studies and coverage of new software that helps to improve outcomes in treatment planning and surgery. Over 1,000 full-color illustrations depict implant techniques and products. Coverage of the Graftless Approach includes two concepts: 1) the anterior tilted implant, and 2) the zygoma implant, each eliminating the need for grafts and producing an implant site less prone to infection and with a quicker healing time. A Computer Guided Surgery chapter covers the latest software developed for treatment planning, creating the surgical template, laboratory procedures, and fabrication of the prosthetics. Case presentations on immediate loading tilted implants and zygoma implants appear at the end of the book, each a beginning-to-end study from Dr. Bedrossian's own archives. Coverage of broader issues related to the edentulous patient includes a discussion of special needs, demographics, and the systemic pretreatment of these patients including bone composites and overall esthetic and functional goals.